Loneliness and social isolation are among the most critical factors leading to health risks for the elderly. Indeed, loneliness is a common thing among older people. According to Connect2Affect, 17% of adults aged 65 and over are isolated, and 51% of those 75 and over live alone. According to this site, the subjective feeling of loneliness increases the risk of death by 26%. Other problems can be added such as stress and depression. In general, the loss of a spouse is the beginning of loneliness among the elderly. It gets worse with the death of brothers and sisters and friends. The social circle also begins to deteriorate due to physical decline. Isolation is increasing as the senior population grows. Regular visits are the best way to help them overcome loneliness. A loving gesture or a simple smile can give them the joy of living for a few days. If they live alone, you can help them cook and share a meal with them. If possible, take your family members with you when you visit them. Plan to attend them at least once a week. 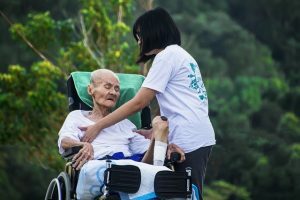 If your elderly parent or relative lives in a retirement home, ask the administration if you can participate in various social activities with him. If he is irritable for medical reasons (such as Alzheimer’s), make brief visits and see the doctor before scheduling your appointments. If you live at a distance, you will not be able to visit them regularly. A simple phone call can make them happy. No need for long phone conversations. Talk to them about your life but do not forget to ask what’s going on in theirs. Discussing them will show that you are interested in them. Talking about small children keeps them feeling connected to your family. Making them learn how to use new techniques such as video calls (Skype for example), e-mails, social networks are a great way to keep in touch. Unfortunately, some seniors cannot use them either because it is too expensive or because they are not motivated. If you don’t get time to do so, register them for specific training for seniors. Cyber-bases, associations or Happy Silvers organize workshops that can help them use new technologies. Seniors who have a goal are more likely to lead a socially fulfilling life. You must surely know their hobbies. Unfortunately, older people tend to abandon them. You must, therefore, encourage them to practice them again or to find others. Sometimes physical or financial problems can force them to abandon them. If they can not pursue them, you can encourage them to change them. For example, if physical constraints have led your loved one to abandon animal photography, why not suggest that you create albums from old animal pictures? ← How To Spot A Fake Psychic And Avoid Scams? How To Spot A Fake Psychic And Avoid Scams? Solutions To Push The Limits Of Age?